What is that expression? It is better to have loved and lost, than to have never loved at all? I think that’s an apt point when considering this week’s film review. Can you imagine experiencing intense feelings of love, pain, and anger all while under constant threat of death? Not only for you, but for loved ones as well. That’s what this story attempts to tackle. 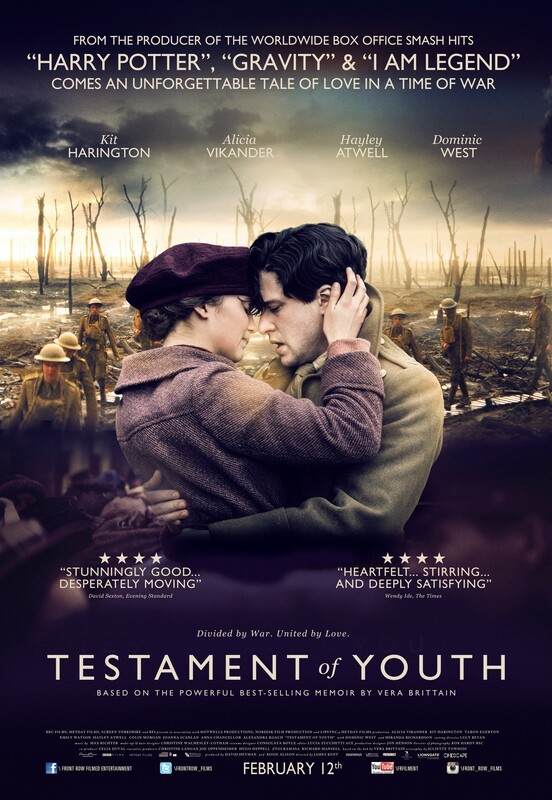 Testament of Youth is a war memoir written by one Vera Brittain (1893-1970) and published in 1933. It happens to be the first instalment in a series of four accounts she wrote over the course of her life. Testament of Youth, followed by Testament of Friendship and Testament of Experience, then the unfinished work title Testament of Faith (also Testament of Time). It is literally a classic story at this point in our history because it tells us of Brittain’s experiences during WWI and embodies not only a woman’s account of war but also the aftermath of it and how it effected her ability to produce a career as a writer, especially in a time when educated women were few in number. But does James Kent do the story Justice? I would argue yes based on his track record. He has been involved in several biographies over the past decade and even had a hand in a biopic on John Wayne in the 80’s. Some notable examples are Gianni Versace, Wolfgang Amadeus Mozart, HG Wells, and Agatha Christie, not to mention accounts of 9/11 and the Holocaust. Spoiler alert, it made my girlfriend cry, and I also suffered from some sweaty eyeballs, so be warned. But let’s get into a bit of the story. Vera’s tells a story which is an eye witness account of the first World War as it happened in Great Britain. The movie deals with themes of love, loss, dreams, war, life, honour, and family, among others. The story starts with a young Vera Brittain (Alicia Vikander) spending a great deal of time with her brother Edward (Taron Egerton) and his two friends Victor (Colin Morgan) and later Roland (Kit Harington) to follow her dreams of becoming a writer. This is particularly challenging for her as she is still quite young, and very strong minded with feminist viewpoints that rub up against most people she encounters, in particular her parents. She eventually takes the exams at Oxford and prepares to take the train there with Roland, as he has plans to write as well. Unfortunately war breaks out almost immediately on the eve of their first semester, and Roland decides to head off to war to support his country. As does Edward and Victor after Vera convinces her father (Dominic West) that it is Edward’s right to defend their way of life. She eventually changes her mind about writing too and enlists as a nurse, all while falling in love with Roland. They both become increasingly involved in the war efforts at danger to both of them, and as Vera becomes one of the nurses who tends to enemy soldiers, she learns a great deal about loss and the problems with declaring sides and assuming evil in other people. This is a story of growth and remembrance, and embraces the ideas Brittain wrote about in her memoir whole heartedly. Much of the primary story remains intact, and elements like Roland’s poems to Vera are quite poignant. I dare you not to be impacted in your heart of hearts. I can’t write too much more about the story without ruining it for you. I recognize that the story has been around for almost 90 years, but I hadn’t read the book myself previously, and I suspect a great many of you readers haven’t either. But I think I just might after having experience this condensed version of the account. Pros: While it has a slow burn at the start of the film, I think it serves the story well, as there is a lasting impact of the key events as the story comes to a conclusion. Kit Harington is quite good in his role as Roland, and the relationship between Victor and Vera is crushing as well. Also the ghosts that haunt Vera are well done. Cons: The story isn’t driven by action at all, and there is no real violence or crude behaviour, so it can be challenging to feel the feelings at times. Points of Interest: The film was shot throughout different areas of England making it a very authentic viewing experience. There is a really well done speech at the end of the film, which you should pay close attention to. Did I mention the ghosts yet? What else can I say? I don’t normally participate in war films, because as another reviewer said, it can be filled with genre candy, and if that isn’t to your taste then you may be surprised when sitting through this one. I am very glad to have been born into a time when something as grand, terrifying, and awful as a world war did not happen, but I think that films like this serve a very important role as reminders to be grateful for what we have, and to recognize the futility of war. So what do you think? Am I nuts? Leave some comments!